If any mountain tent out there has become synonymous with serious expeditions to high peaks it has to be the North Face VE 25. Go ahead and pull up just about any image of high camps on the world’s highest mountains and I guarantee you that there is a good chance that it will be this tent. It has a reputation that has been earned over many years and deservedly so. This was one of the first tents to use a frame with a geodesic design which offers incredible strength relative to weight. It is this design, which spreads the force of gale-force winds and helps the tent shed the loads imposed on it, that has led to it becoming such a staple expedition tent over the past two decades or so. 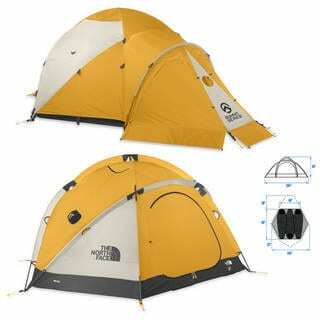 Moreover The North Face have not just sat back but have constantly improved this tent over the years so even as others have caught up with it, few have managed to surpass it. The first thing to note about the VE 25 is that it is incredibly roomy. Most serious expedition tents are actually quite a squeeze, especially considering the quantity of gear that has to get squeezed into them. Have you ever seen how big a serious expedition-worthy sleeping bag is, for instance? The next notable feature is that these tents are festooned with guys, ropes and anchors so that they can virtually be bolted down to hold up against strong winds and storms. These tents also have a great vestibule (that’s kind of tent-speak for front porch). On an expedition this is essential. You want somewhere sheltered to store your gear, cook your food and kit up. This sounds silly but part of what you want a vestibule for is to get your boots and crampons on and you can’t do that in the tent itself because you can’t be how quickly you will rip the groundsheet of your tent with the sharp edge of crampons, no matter how careful you are not to. You also want to be able to fire up your stove to melt snow and cook in there because doing so reduces the risk of carbon monoxide poisoning, which can be a real danger in an enclosed space such as a tent. Another cool thing about the North Face VE25 is that it has kept on improving over the years. The newer ones are made from tougher materials than the older ones. The current ones are made from ripstop polyester. They also have have some really nifty little plastic windows. The guy lines are made from Kevlar, the same material that is used in bullet-proof vests, so they are tough as steel and pretty light. The company also re-engineered its poles in 2002, producing its new “featherlight” poles, which offer superior strength to weight compared with the older ones. They also have sophisticated inserts to go into the joints of the poles and reinforce what is usually the weakest point in a tent pole. North Face has also not spared and cost in getting the little details right such as giving the zippers little glow-in-the-dark pullers so you can find them easily at night. It also has the usual little internal pockets to stow small bits of gear such as a head torch. You may not like the colour, it does stand out quite a bit, but that’s not such as bad thing if you are trying to make your way back in low visibility (they also have a bit of reflective tape on them which makes them really light up from a distance when you shine a light – great for late night descents). They aren’t cheap, at around $550 to $600 a pop, depending on where you go shopping, but they are great quality. A lot of people have been using theirs for going on 20 years now so it you figure that you’re only paying about $20 a year for one of the world’s greatest tents, then it doesn’t feel too bad.